Completely renovated this year, Hôtel Le Louis Versailles Château, MGallery by Sofitel is now a four-star hotel inviting travellers to immerse themselves in the splendour of the Court of Versailles. 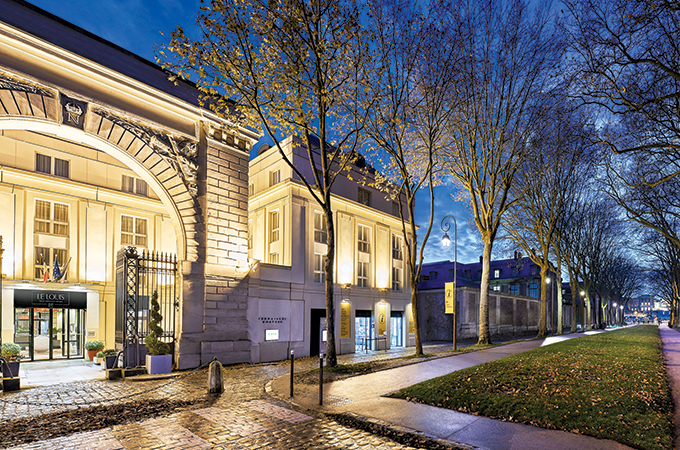 The hotel’s resolutely contemporary design, draws its inspiration directly from the neighbouring Palace of Versailles. Situated just 200 meters from the Palace of Versailles and its Gardens, Hôtel Le Louis Versailles Château enjoys a prime location. It is the ideal starting point from which to explore the most beautiful cultural and historic sites of the Royal City, such as the Royal Opera, the Centre de Musique Baroque and the Théâtre Montansier. Versailles is an international tourist destination boasting an exceptional heritage. It was conceived four centuries ago at the behest of King Louis XIV, and constructed by Jules Hardouin-Mansart and André Le Nôtre, respectively the principal architect and principal gardener to the King. The result is an authentic and welcoming city with nature ever present, an atmosphere that has been reproduced at Hotel Le Louis Versailles Château. Thanks to its proximity to the city’s two main railway stations, Paris is just a 20-minute journey away. Light reigns supreme in the architecture of the hotel: it shapes every area and imbues each of the spaces with a unique ambience. From the lights illuminating the facade at night to the impressive central glass roof, the majestic chandelier in the hotel bar and the mirrored sconces that disperse light throughout; everything recalls the Sun King. In the 152 rooms, which include seven suites, the past interacts with the present to create a plush and restful ambience: antique mirrors, conical lamps that recall the trees in the royal gardens, classical LED chandeliers, carpets inspired by herringbone parquet flooring and elegant white marble bathrooms.